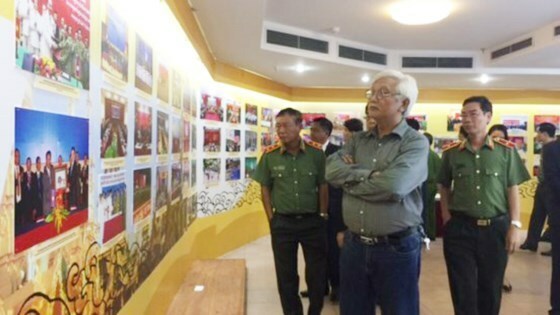 Hanoi (VNA) – An exhibition exploring the cooperation among Vietnam, Laos and Cambodia in crime fight was launched at the Public Security Museum in Hanoi on August 17. The opening ceremony saw the presence of Minister of Public Security To Lam, Cambodia’s Deputy Prime Minister and Minister of Home Affairs Sar Kheng, Laos’s Minister of Security Somkeo Silavon, and others. Nearly 200 photos and materials document the sacrifices and dedication of the public security forces of the three countries in the effort to maintain social order and safety as well as reflecting the friendship and solidarity among the three countries. Addressing the opening ceremony, Minister To Lam stated that Vietnam, Cambodia and Laos have established a close friendship and cooperation across sectors, especially their coordination in defence and security fronts.